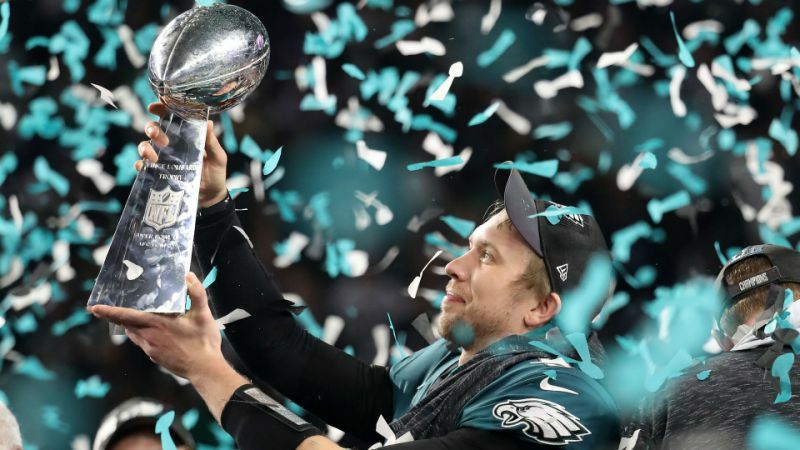 MINNEAPOLIS – In the wildest shootout in Super Bowl history, unheralded Nick Foles outdueled legendary Tom Brady to lead the Philadelphia Eagles to a Super Bowl title, defeating the New England Patriots 41-33. Foles went 28-for-43 passing for 373 yards and three touchdowns, including leading a come-from-behind, game-winning drive late in the fourth quarter. A backup most of the season to Carson Wentz, Foles was particularly brilliant when it mattered the most, on third (10 of 16) and fourth downs (2 of 2) in clutch situations. He even caught a touchdown passat the end of the first half. New England somehow lost despite never punting. Brady, seeking his sixth championship, broke his own Super Bowl record for most passing yards with 505. He went 28 for 48 and tossed three touchdowns. It was Foles who was the champion and Super Bowl MVP, though. 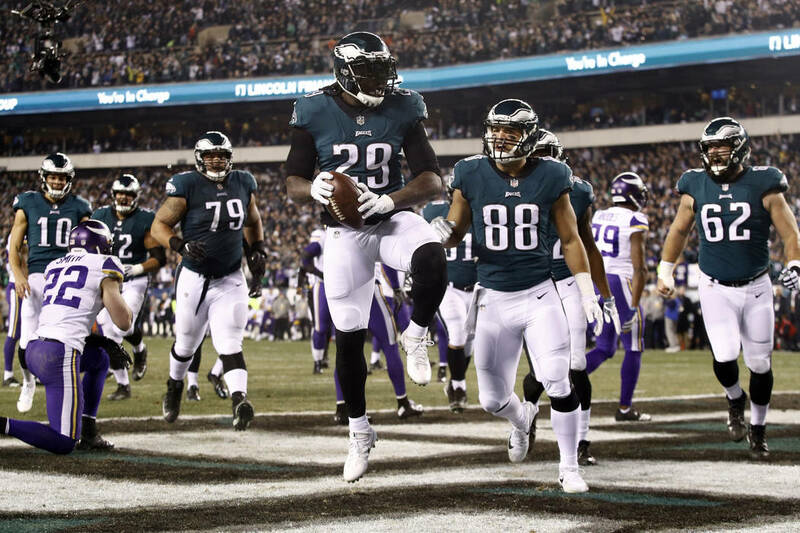 Trailing for the first time in the game, 33-32 with 9:26 left in the fourth quarter, Foles led the Philly offense on a legendary game-winning drive. It included converting twice on third down and once on fourth down, often by the smallest of margins. It ended with a six-yard touchdown pass to wide receiver Zach Ertz, who leapt across the goal line. Ertz lost the ball on contact with the field just after he crossed the goal line. Replay ruled it a catch, determining he had made a football move and became a runner therefore the play was dead when the ball crossed the plane of the end zone. It wasn’t the first controversial “Was it a catch?” call. In the third quarter, Foles hit running back Corey Clement on a 22-yard dime into double coverage. The running back initially controlled the ball, bobbled it a bit and then appeared to fail to get both feet in the end zone. Initially ruled a touchdown, it was upheld on a controversial replay review and brought one of the NFL’s most tired storylines – what’s a catch – to the Super Bowl. Not this time, though. The Eagles defense stepped up when Brandon Graham strip-sacked Brady, causing a fumble that was recovered by the Eagles. It was the first sign of life by the Philly defense. New England, to that point, had neither punted, turned the ball over or allowed a sack. Philly kicked a field goal to extend the lead to eight. 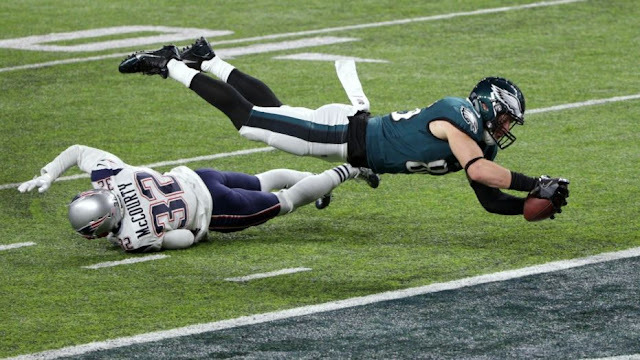 Philadelphia Eagles stop New England Patriots hail mary attempt to win Super Bowl LII. The game was an offensive classic, setting multiple Super Bowl records, including most yards gained … and that came before the start of the fourth quarter. By the time it was over, both teams had combined for 1,151 yards, 143 plays and a single punt. There was 683 total yards. 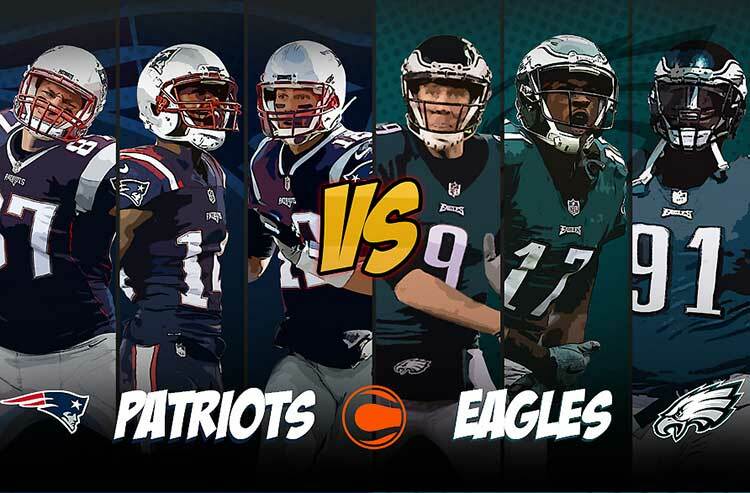 A brilliant 37-yard Foles-to-Alshon Jeffrey touchdown pass. A 46-yard Rex Burkhead catch and rumble. Tom Brady dropping a pass from Danny Amendola that hit him directly in the hands. Foles catching one for a touchdown on a daring fake-audible, wildcat snap, reverse, throw-back to the QB. Corey Clement had a 53-yard catch-and-run for the Eagles. LeGarrette Blount rumbled for 36 and added a touchdown. New England saw Danny Amendola haul one in for 50 and Chris Hogan for 43. James White scored on a 26-yard run. The pregame festivities were mostly eventless. All players stood for the national anthem, as they have for the entire playoffs in a movement that had mostly faded away this season until it was rekindled by President Donald Trump in Week 3. Pink sang the anthem well after taking out a throat lozenge just before performing. At halftime, Justin Timberlake performed a number of hit songs, including singing “I Would Die For You” as the image of Prince, a beloved native of Minnesota who died last year, was projected onto a giant curtain inside U.S. Bank Stadium. New England Patriots quarterback Tom Brady reacts to his fumble late in the fourth quarter of Super Bowl LII against the Philadelphia Eagles.